Debutante Jordin Mayez stole the show as Uganda got off to a winning start in Turkey with a 90-72 victory over Iraq. Uganda who is currently preparing for the upcoming FIBA World Cup qualifiers in Nigeria later this month are camping in Turkey as part of their preparations. 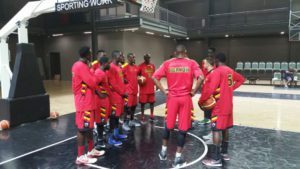 Mayez scored a game high 26 points to propel Uganda to the victory in a game played at the Adalet Turn Sports and Convention Centre. The un-known to many Ugandans Mayez, shot 3-6 and 4-6 inside and outside the 3-point arc respectively, adding six rebounds and five assists to his impressive tally. Fellow debutant Deng Giu added 13 points in the victory. It was a tight contest between the sides as they were level at the end of the first quarter, with the score-board reading 27 all. The Silverbacks edged the second quarter as they scored 18 points to take a 45-39 lead into the long break. The boys managed to finish off the game: Winning the third and last quarter 25-15 and 20-18 in that order to seal the victory. Robinson Opong scored 13, Samuel Kalwanyi made 10 as Ivan Lumanyika and Syrus Kiviiri added nine and eight points respectively. Ali Ismael and Demario Mayfield scored 19 and 14 points respectively for Iraq. Uganda will now hope to continue with its impressive start when they take on Saudi Arabia on Sunday. The Silver Backs will take on the trio of Rwanda, Nigeria and Mali in the FIBA World Cup qualifiers starting on 29th of June.